Dog houses help keep our canine friends warmer in the winter and cooler in the summer, while providing a safe, dry shelter all throughout the year. They can be customized to fit your dog’s specific needs making it the perfect do-it-yourself project. Most often they are built with wood, but there are many options available such as composite wood, or even plastic lumber. 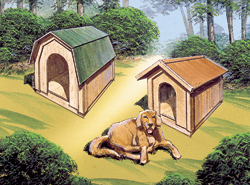 Take a look at our doghouse plans and find the perfect one to suit your family’s best friend. Our collection of doghouse plans includes different styles so you can pick the perfect place for your family's furry friend. We offer easy-to-follow blueprints that make this building project simple and easy right from the start. With a variety of plans, we are sure that you will find the perfect do-it-yourself project to fit your needs.